It’s a big day for Tableau—we’re excited to announce that Tableau Prep (previously known as Project Maestro) is now available! Tableau Prep is a brand-new product from Tableau designed to help everyone quickly and confidently combine, shape, and clean their data for analysis. The direct, visual experience gives you a deeper understanding of your data and smart experiences make data prep easier and more accessible. Plus it’s seamlessly integrated with the Tableau analytical workflow, making it easy to go from data prep to analysis. Tableau Prep is included alongside Tableau Desktop in the new Tableau Creator offering. Existing Tableau Desktop customers with maintenance can also get Tableau Prep as part of their maintenance benefits. In my conversations with customers over the years, I’ve seen the pain that comes from preparing data for analysis. A recent Harvard Business Review article reports that people spend 80% of their time prepping data and only 20% of their time analyzing it. We know that preparing data for analysis can be a repetitive, manual, and time-consuming process. We’ve designed Tableau Prep to reduce the struggle of common yet complex tasks—such as joins, unions, pivots, and aggregations—with a drag-and-drop visual experience. No scripting required. 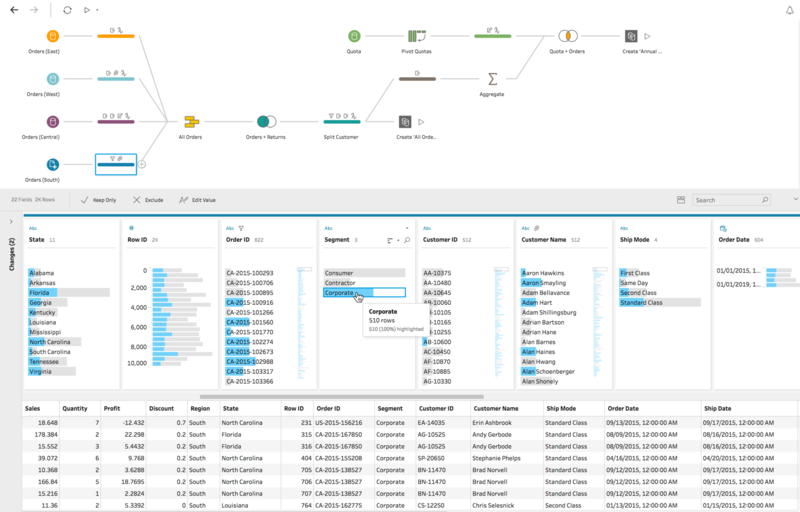 Tableau Prep is built around three coordinated views—a data grid to see your row-level data, a profile pane to look at profiles of each column, and a flow pane to understand your entire data preparation process. Pick which view to interact with based on the task at hand. And since these views are coordinated, when you make a change in the profile pane, you instantly see the result in the flow pane and data grid. This direct and visual experience makes it easy to see the impact of your changes, giving you greater confidence in your final data set. Tableau Prep’s smart algorithms help you overcome common data prep challenges. Let’s say you have multiple instances of the same data point. In the example below, there are multiple spellings of the same customer name that need to be grouped. Tableau Prep employs a fuzzy clustering algorithm to turn repetitive tasks like grouping by pronunciation or cleaning based on punctuation into one-click operations, so you can get to your analysis faster. Tableau Prep is integrated into the Tableau analytical workflow so you can quickly move from data prep to analysis. Open your Tableau Prep flow in Tableau Desktop at any time or share it with your colleagues over Tableau Server or Tableau Online. Tableau Prep uses the Tableau data connectors, calculation language, permissions, and data source certifications that you already know and love—so you can get up to speed quickly and share your data. Tableau Zen Master, Joshua Milligan participated in the public beta and commented in his blog VizPainter on how Tableau Prep offers the same paradigm as all the Tableau products before it: "It brings the intuitiveness and transparency that Tableau brought to visual analytics and actually makes data prep fun!" Brian Davis, Project Engineer at an energy company spoke about how "The visual aspect makes data prep quick and easy. It brings context to the data by providing instantaneous feedback on the effects of joins and filters." Slalom consultant, Gordon Strodel advised in a recent blog post: "For those of you who are venturing into the world of data preparation, are actively shopping for that capability, and already have Tableau: Keep riding-out your woes in Excel. Wait for [Tableau Prep]. Yes, it’s THAT good!" We’ve made it easy to use Tableau Prep with older versions of Tableau Desktop and Tableau Server. Tableau Prep is compatible with older versions of Tableau products, all the way down to Tableau 10.0 and can output .tde and .hyper files along with .csv files for use with other applications. We’re moving fast and will be launching new features frequently for Tableau Prep, independent of the Tableau Desktop, Tableau Server or Tableau Online release cycles. 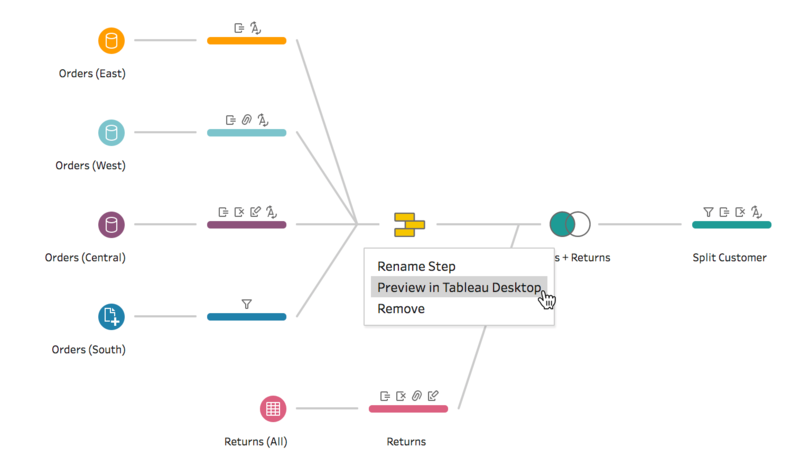 Customers will need to upgrade to the latest version of Tableau Prep to take advantage of new features and product fixes. Post your questions and feedback on the Community Forums. I can’t wait to hear about how you’re putting Tableau Prep to work!